With more than 17,500 islands, Indonesia’s culture is so diverse that differences in culture can make an Indonesian in one region almost seem like a foreigner in another. The same differences are apparent in its food, thus there is no such thing as a single Indonesian cuisine. Having visited the country several times from the late ‘90s to the mid-2000’s, we have come to enjoy Indonesia, its people and its cuisine. We like several Indonesian dishes so much that Nina sometimes cooks sate ayam for guests at our house and Leo grabs some Indonesian instant noodles whenever they’re available locally. 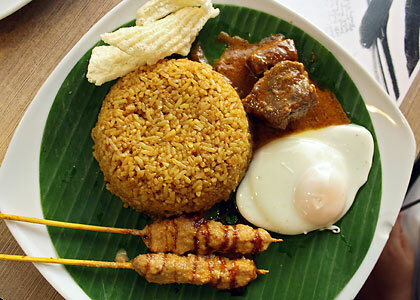 A plate of nasi goreng with fried egg, kerupuk and sate ayam or barbecued chicken. Photo courtesy of Sam and Grace Kammerer. 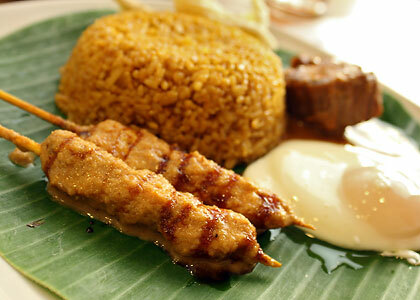 Some of the more popular Indonesian dishes happen to be our favorites too. 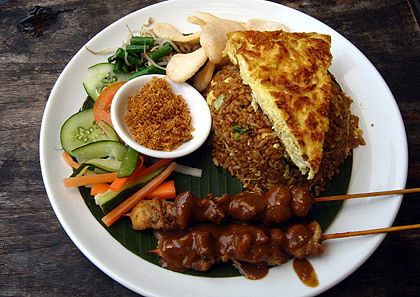 Nasi goreng is simple fried rice prepared with garlic, onions and kecap manis or sweet soy sauce, Indonesian style. In most street stalls a fried egg and kerupuk (prawn crackers) are added to complete the dish which is usually served for breakfast, although nasi goreng can be taken any time of the day. In restaurants it is used to accompany meat and other dishes. We’ve already mentioned sate ayam or grilled skewered chicken usually served with spicy peanut sauce (the latter is a key ingredient of many Indonesian foods especially Javanese). Turmeric is usually added to marinate sate ayam resulting in its characteristic yellowish color. 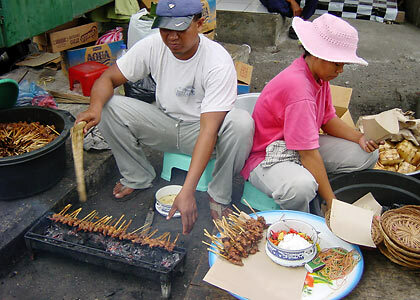 According to our good friend Greg Alberto who worked as a consultant for several years in Indonesia before migrating to America, sate ayam is best eaten at open-air street stalls. We have to agree. Our first taste of this dish was at a market stall in Jakarta and we still vividly remember the experience. There are other barbecued dishes such as sate kambing (barbecued goat or mutton) but sate ayam continues to be our favorite. Other Indonesian dishes that we’ve enjoyed are gado-gado, a vegetable salad with the ubiquitous peanut sauce as a dressing, various types of soto or soup made from broth, meat and vegetables and ikan bakar or grilled fish served with spicy sambal. The latter is another key ingredient of Indonesian food and is made from a variety of chili peppers. We like it so much that Nina prepares it for Indonesian or Malay-inspired dishes she cooks for guests at home. An interesting and favorite dish of ours is a kind of fried ikan or fish that is served standing up like a coiled cobra(!). This is the effect of cutting up the fish meat in long strips but keeping the strips attached to the spine and then deep frying the whole thing. The result is a dish so crunchy that even the bones can be eaten. An interesting dish we’ve encountered is nasi padang, a type of dish that originated from (where else) Padang in Western Sumatra. We first tried this dish in Medan and found it hotter than most Indonesian dishes we’ve eaten up to that point (not as hot though as Manadonese or Northern Sulawesi dishes). Nasi padang is not a single dish but a variety of different dishes usually made with cloves, cardamom and coconut milk. A classic example is rendang or meat cooked in thick coconut milk – another of our favorite Indonesian dishes, by the way. What makes nasi padang unique is that each dish is served separately on a small plate. The customers choose the dishes and pay only for those they have taken (it’s also a case of touch-move because once you take the slightest bit or morsel from a plate, that plate is considered sold). There are several Padang restaurants across Indonesia, testimony to the popularity of this kind of cuisine. 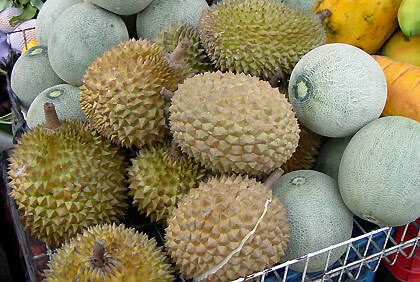 Much to our delight, we discovered that many places in Indonesia have a plentiful supply of durian fruit. 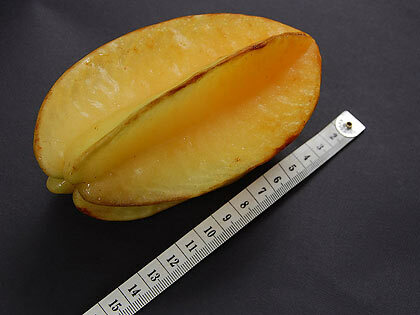 Just as in Davao, Philippines, the most delicious ones were the native varieties. There are roadside stalls in many cities that serve this delectable fruit and it seemed we never visited Indonesia without dropping by one of these stalls. The Indonesian belimbing is larger than the Philippine balimbing. To ease the passage of all that food down your stomach the Indonesians have a variety of fruit juices and shakes. Our favorite is the avocado shake usually served with chocolate syrup. Curiously they also serve belimbing (Filipino balimbing, carambola or star fruit in English) juice from the fruit that has acquired a somewhat notorious reputation in the Philippines back in the 1980's when it was used to denote political turncoatism. 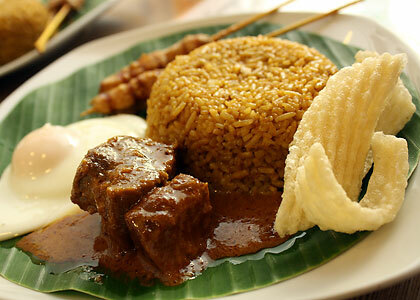 We never tried it but we could only hope that the Indonesian belimbing, which looks larger, does not have the taste that made the Pinoy balimbing such an ignominous word.